Glasgow Punter: Me and The MacPhees, a Lochaber History. Me and The MacPhees, a Lochaber History. 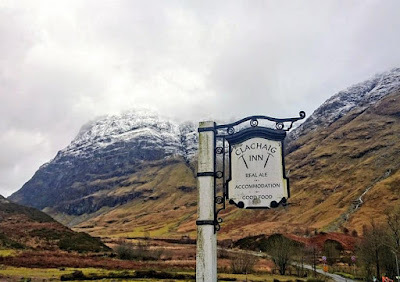 I was recently up at the Clachaig Inn in Glencoe with my family. It reminded me of all the old stories that my granny told me about her relative that used to be the innkeeper there. She always said that it was him that put up the original "No Campbells" sign in the entrance of the hotel, harking back to the Campbells' infamous role in the massacre of Glencoe. As usual with my granny's stories, once you start digging into them, they all turn out to be true. So here is a wee look at two of my relatives that she used to talk about; Donald MacPhee that ran the Clachaig Inn, and Ewen MacPhee, the "last outlaw". When I was a teenager, growing up in Glasgow, I started camping and hillwalking with friends in Campsie Hills. Once we had the bug we walked the West Highland Way a couple of times and I got to know the stretch of Scotland between Glasgow and Fort William very well. We often hitch-hiked up the A82 at the weekend, pitching our tents in Glen Douglas at Inverbeg, or up to Glen Etive and Glencoe, regularly camping near the Kingshouse Hotel or the Clachaig Inn. This led my granny to start telling me stories about our family from up that way. Brought up in the Gorbals, she was born in 1915 and talked about her many relatives in great detail. She told stories from a century ago as if they had happened the week before. Her stories were so detailed, that as a teenager I spent some time with her trying to make notes on all these colourful relatives. Looking at my old notes now I have scribbled mini-biographies of about 200 people, across five generations and four continents. When I spent a summer working in Toronto in the 1990s, she arranged for her "cousins" there to put me up for 2 months, which they happily did. When I plotted out all these relatives on a family tree I found that my Canadian cousins were actually my fifth cousins through my Kilmonivaig great-great-great grandfather Alexander MacPhee. Once I was able to drive we went on a couple of runs up to Spean Bridge with my granny, to places she remembered visiting family when she was younger. 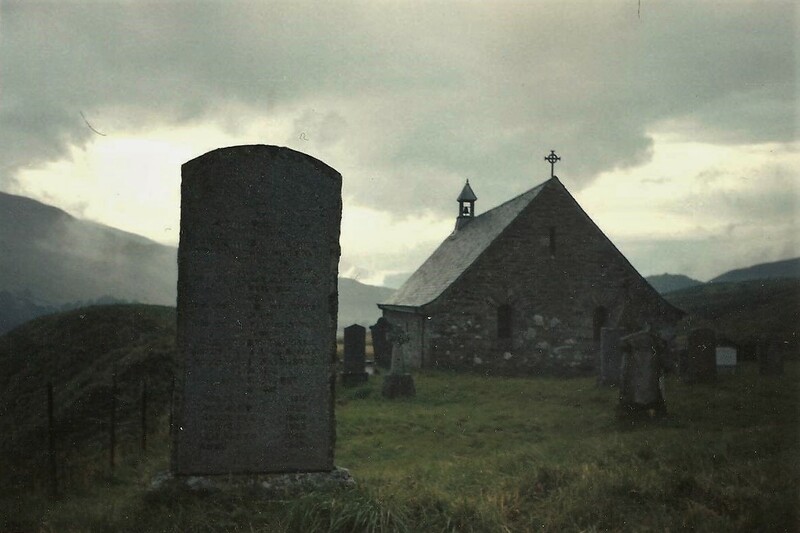 One of the most evocative places she led us to was Cille Choirill church, the site of a Catholic church since the 15th century, with beautiful views down Glen Spean. Here we found the gravestone of Alexander MacPhee I mentioned above. The details on this about his family, and later researches that I made confirmed that my granny's recollections were usually absolutely spot on. Cille Choirill is worth visiting if you are passing along this way. In the graveyard are buried the Gaelic poets from the 16th and 17th century, Dòmhnall Mac Fhionnlaidh nan Dàn and Iain Lom. My granny died over 20 years ago now, but I have carried on trying to find out more about these people, as their stories are also the history of the Scotland they inhabited. Farming people who were forced off the land, or left it to seek their fortune elsewhere as new industries grew up. They gravitated to the cities, or emigrated to find work and start new lives. 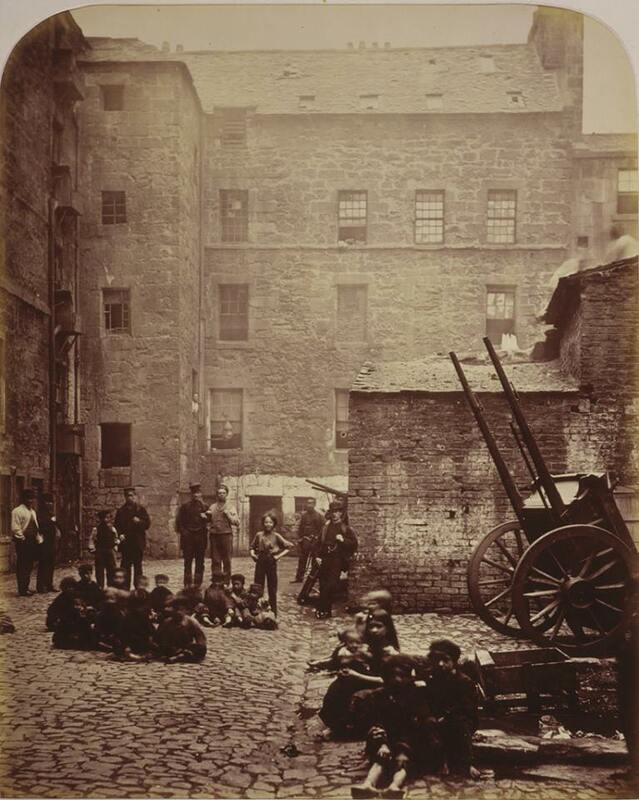 In the 1880s my granny's father was born in Saltmarket in Glasgow and her mother in Partick around the same time. Like many people in the growing city of Glasgow at that time, her grandparents were migrants to the city; from rural Ireland on one side and rural Scotland on the other. Her father's family had left Roscommon and Leitrim in Ireland to come to Glasgow, but the parents of her mother, Bella MacPhee, had arrived in Partick from the Highlands. Bella's father, John MacPhee, was born near Spean Bridge, just north of Fort William, in 1857. Her mother, Kate Henderson, was the daughter of a ploughman in Alness, Ross Shire. She came to Glasgow as a teenager, working initially as a domestic servant in Partick. 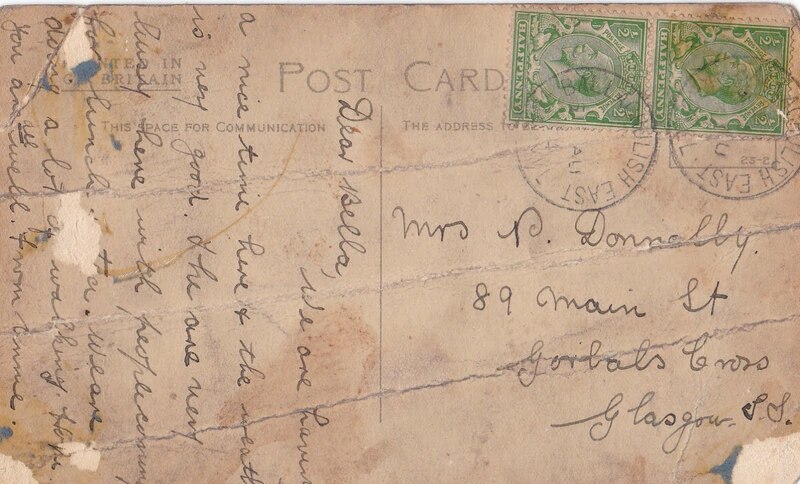 John MacPhee was working as a hotel servant in Banff in 1888 before he joined Kate in Glasgow and married. He was the third oldest of at least 10 siblings, and several of his brothers and sisters worked in hotels and as housekeepers. 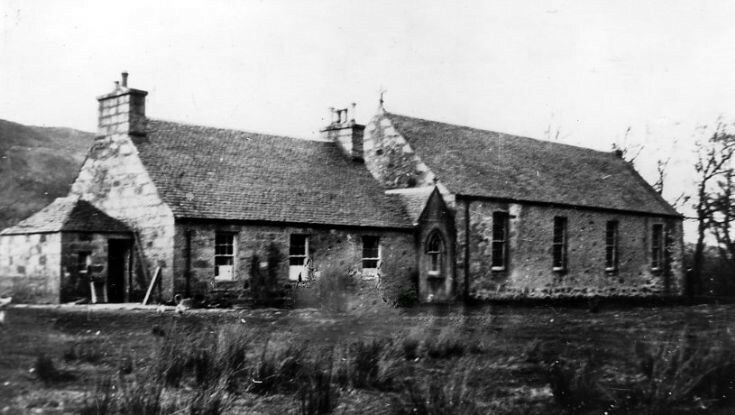 His sister Betsy was a housekeeper in Ardlui, Maisie in the Kingshouse Hotel and the Black Corries Lodge. His brother Donald MacPhee, 14 years his junior, spent the last 15 years of his life running the Clachaig Inn. 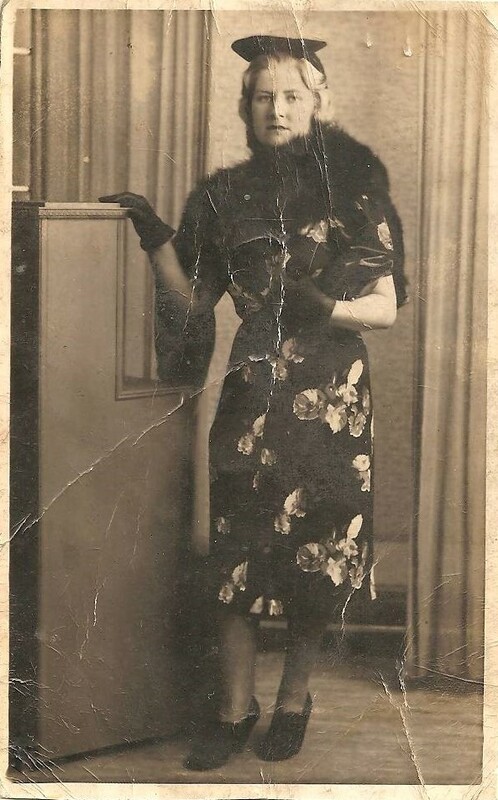 My granny seemed to go by three different names. She had her married name. Most of her old friends still referred to her by her maiden name, Donnelly. On top of that, she thought of herself by her mother's family name - MacPhee. She would proudly tell me that we were MacPhees, "tinker folk". McPhee is still a common name in the travelling community. The word "tinker" though often used pejoratively, actually just derives from "tinsmith" as many travellers made a living going from place to place repairing metal pans and utensils. The MacPhee name is originally connected with the island of Colonsay, and McFies are recorded to have fought with Robert the Bruce at Bannockburn. The MacPhees (gaelic Mac a'Phi) were traditionally the keepers of the records for the Lord of the Isles, Scottish nobility associated with the MacDonalds until King James IV ended their rule in 1493. After the fall of the Lordship of the Isles the MacPhees dispersed, with many becoming rootless and known as itinerant tinsmiths. Other MacPhee clansmen settled in the Cameron lands of Lochaber, where my family hail from. There the MacPhees were followers of "Cameron of Lochiel". In the 1700s there are several MacPhees renting land around Glendessary and Lochiel. In 1718 a John MacPhee is renting land here. He had two sons, John and Ewen, who "sustained considerable losses at the hands of Cumberland's forces after Culloden"1. In 1745 one of the pipers welcoming Bonnie Prince Charlie at Glenfinnan was a Lochaber MacFie and later that year more were fighting on the right flank at Culloden with Cameron. After Culloden, retribution for those on the Jacobite side meant many lost land and there are records of two MacPhees who resorted to cattle stealing in order to survive, forming marauding bands with others after 1755. In 1750 another MacPhee in this area was an innkeeper, Ewen MacPhee, recorded as the Changekeeper (or Innkeeper) for an inn in Erracht, nearer to Spean Bridge. In 1788 there were ten MacPhee families living in Glendessary, but most of them were evicted in 1804 at the time of the Lochaber clearances. A tomb in Old Kilmallie churchyard in Corpach has a stone to Alexander MacPhee, "late tenant at Coul in Glendessary, died 1836 aged 66". Many of these MacPhees are related but the records make it hard to pin down exactly how (also they do keep recycling the same three forenames). However that is not important, I mention them to flag up recurring points. They were repeatedly fighting for the Jacobite cause, often on the losing side to Campbells or English soldiers. Already we have found an innkeeper and a cattle rustler, which leads me seamlessly to another two who followed those career paths. On driving through Glencoe the beauty and the atmosphere of the place are immediately apparent. The changeable weather lets your imagination run back to February 1692 when many men of the Clan MacDonald of Glencoe were killed. Forty women and children later died of exposure when they fled as their houses were burned down. The "massacre of Glencoe" may not have been the bloodiest slaughter ever in Scottish history, but the callousness and treachery involved mark it out. Many clans had sworn allegiance to the deposed Stuart king, so orders came from King William of Orange in London for the clans to sign an oath of allegiance to him, or face punishment. The MacDonald clan chief faced delays and had to trek in a bitter winter to Inverary, run by their Campbell adversaries, to deliver his oath. In Edinburgh the late-delivered oath was declined and a Campbell dominated regiment of the Argyll regiment was billeted with the MacDonalds in Glencoe. Received as friends seeking shelter, they were taken in under the code of Highland hospitality and stayed there for 12 days before their orders came to kill everyone in the village. Thirty-eight men were killed next morning, including the chief, others died on the hillsides in a harsh blizzard. In the 1700s Glencoe was still viewed as a dangerous place, so the military road to Fort William that was laid out in 1752 ascended the high pass at Altnafeadh. Here the Devil's Staircase zig-zags up the incline before descending towards the river crossing at Kinlochleven and onwards to Fort William. The road that eventually replaced it, through Glencoe to the ferry crossing at Ballachulish, was the drovers' road laid out in 1786, on which the Clachaig Inn still sits. The Clachaig Inn website dates its history back over 300 years. However it must have been this road, parallel to the current A82 at this spot, that brought new travellers to its doors. 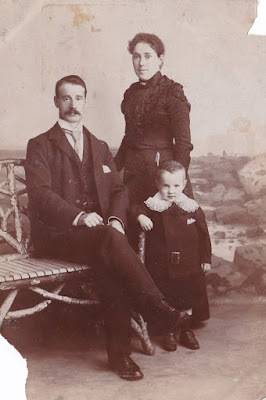 My great-great grandfather John Macphee was the son of Alexander MacPhee and Kirsty MacMaster. 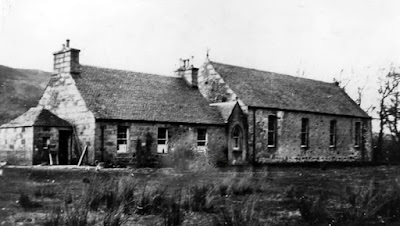 Alexander and Kirsty were married in 1857 at Bunroy Chapel in Roy Bridge. They were crofters at Brackletter near Spean Bridge. My granny told me that Alexander MacPhee's father lived in Fort William, and that five of his sisters had to emigrate to Australia because of the Lochaber clearances. For them it was Lochaber no more. My great-great-great grandfather Alexander MacPhee died in 1904 and Donald MacPhee took over the croft at Brackletter. He was also working as a "surfaceman" for the North British Railways, a track worker. In 1920, aged 48, he married a neighbouring crofter, Lucy McColl, who was then aged 34. The wedding took place in the Gorbals in Glasgow, where my granny was a 5 year old girl. 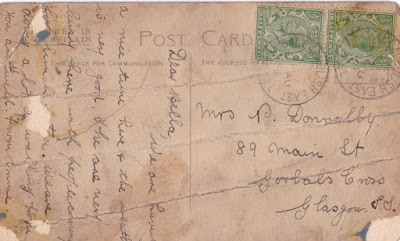 Her father, Peter Donnelly, was a witness at the wedding showing how connected all the family still were despite dispersing around the country. In 1920 on returning up north, Lucy and Donald MacPhee (who sometimes spelled his name McPhee) took over the running of the Clachaig Inn, 30 miles south from their crofts. The valuation rolls show that they were still running it until 1935, the year that the National Trust for Scotland bought the whole estate of Glencoe, which included the Clachaig Inn. "Dear Bella, we are having a nice time here and the weather is very good. They are very busy here with people coming for lunch and tea. We are doing a lot of walking. Hope you are well. From Annie"
It was a time of change for the Clachaig Inn. More traffic on the road and the increased numbers of cars meant that between 1930 and 1934 a new road was cut through Glencoe, the route of the current A82. This crossed the River Coe further down the glen and left the Clachaig Inn off to the side. However it already had a reputation as a hub for those enjoying the great outdoors, particularly popular with mountain climbers, or those just walking, like my auntie Annie. 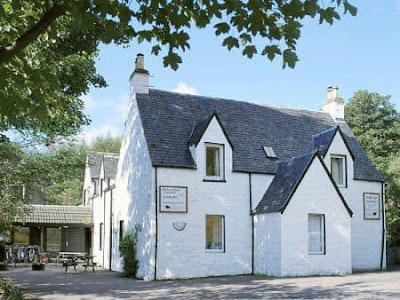 In 1930 Donald and Lucy MacPhee had their only son, Archie, whilst they were at the Clachaig Inn and on his birth certificate, the Clachaig Inn is recorded as the place where he was born. In 1936, aged only 64, Donald MacPhee died, back at the croft in Brackletter, from heart problems. What of the "No Hawkers or Campbells" sign in the foyer of the Clachaig Inn? My granny always said that she knew for certain that Donald put that up. 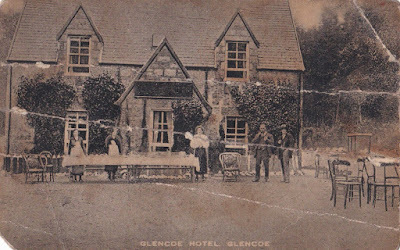 Although a version of the sign still welcomes guests to The Clachaig Inn, it is of course more in jest now. However my granny was quite sure that it was put there by Donald in earnest, that he meant it. We will never know, but I have always found my granny's tales to be reliable.As a local man, from a Catholic family with Jacobite leanings, the circumstantial evidence supports her assertion on this one, I would argue. (Addendum May 2018- I just came across this newspaper clipping among my granny's papers, recording the marriage of Archie MacPhee, the son ofDonald and Lucy. He married Marion MacDonald at Kilmonivaig Church, walking under an arch of shinty sticks, as he was apparently a well-known player). Another MacPhee that my granny told me was a relative was a certain Mr Ewen MacPhee. She had told me that this man lived on an island, was a proud Scot and used to shoot at Redcoats if they approached. Although this sounds like a fanciful tale from Jacobite times, this character did exist. However, not in the 18th century, but in the era of steam trains, paddle steamers and Queen Victoria on the throne. His life story seems so outlandish it is surprise that nobody has thought to make a film of it. from RR McLan's book of 1848 "Highlanders at Home, on Heather, River and Loch"2. When Donald MacPhee's father Alexander was a child in the Spean Bridge area, Ewen MacPhee was living 20 miles further north on an island in Loch Quoich. He was born about 1785 in the Glengarry area, Lochaber. Around 1807 at the start of the Peninsular War against Napoleon's forces, he was conscripted by his laird to the British forces and proved to be an effective soldier, rising through the ranks. As he was unable to read or write, his promotions could only go so far and he is reported to have taken umbrage at this. There is also some reports of money going missing whilst he was fighting in Spain. Whatever the reason, he eventually deserted. Back in Scotland he was arrested in the Glengarry area, where he was hiding with his sister. Contemporary newspaper reports talk of him being handcuffed and led aboard a steamer at Corpach, by a band of soldiers, but slipping free of his bonds and fleeing, with their musket shots going past his head. He lived wild for 2 years near Loch Arkaig, before deciding that the chase was up and settling on an island in Loch Quoich. Never paying any rent or asking any permission he lived out his days here, and despite his roguish ways seems to have been indulged by the local laird. He took a young wife, Mary, who was reportedly 14 years old when he took her to his island. There they built a bothy and raised a family. The island afterwards took his name, as this 1872 map or Loch Quoich shows, although the island is now submerged below the waters of the loch, after the levels were raised for a hydro-electric scheme in the 1950s. He was well known for steeling livestock, but also feared and consulted by poor local residents. He was a tall and imposing figure, and apparently always wore Highland dress, carrying a dirk and a gun with him and threatened anyone planning to arrest him that he would never be taken alive. He was regarded as a seer, who was able to weave charms and heal sick cows. Also when English millionaire Edward Ellice took over the estate, he viewed him as a piece of local colour and MacPhee would come to the estate and pose for paintings to be done by young ladies. 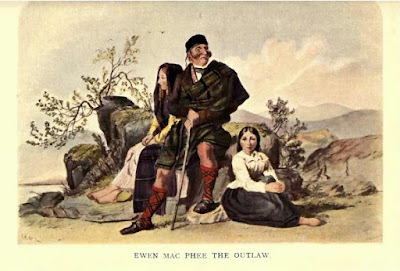 In August 1846, the Inverness Courier has a story of "the well-known singular outlaw Ewen MacPhee" attending a "Highland Competition and Sports Gathering" in Fort William, where a crowd of 3000 to 4000 people had gathered. It reports that he "left his solitary fastness at Glenquoich to be present at the animating scene, and appeared to be highly delighted with it". He entered the competition for those wearing Highland dress and won the third prize of £1 10s that day. Such indulgent tolerance of his outlaw behaviour did not last. As complaints from neighbours about the extent of his sheep stealing increased two sheriff's officers rowed out to the island to investigate. MacPhee was not at home, but his wife chased off the approaching officers by firing on them, and they fled. Returning a week later in greater force they found large quantities of tallow and skins on the island and arrested MacPhee, who was in his sixties at this time. He was taken away to prison, but no record of the charges against him remains as he died in about 1850 whilst in captivity from cholera, before coming to trial. The 1841 census records him living on Loch Quoich Island, aged 55, his occupation noted as "Army Ind". His wife Mary is aged 29 at that time and they have six children aged between 13 and 3 years of age living with them on the island, as well as Maryanne McIntyre a 20 year old "female servant" and Duncan McIntyre, a 15 year old "agricultural labourer". Not long after Ewen MacPhee's death, in the 1851 census Mary MacPhee is living in Fort William, with her occupation recorded as "wife of soldier (deserter)". There are three further children living with Mary, including her youngest, a daughter Ann. Unlike the rest who were born on Loch Quoich, Ann was born in Fort Augustus, which suggests this is where Ewen MacPhee spent his last days. 1851 was also the year his family got their name recorded in the local history books again. Popular local doctor, William Kennedy of Leanachan attended to Mary and her children that year when they were affected by typhus. Reports tell of how he attended to them and "cleaned their poverty stricken hovel". Through helping them the doctor contracted typhus and later died from it, with 1400 people attending his funeral and a statue being erected in his honour. A turbulent time in Scottish history, remembered by my granny and her stories of ancestors who lived through it. Fascinating post. I thoroughly enjoyed it. I might quibble with a few details -- not your granny's memories -- but some of the other comments. However, very good on the whole. It is great to see the McPhees remembered. 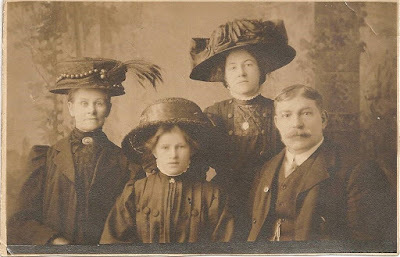 My ancestors emigrated to Canada c 1821. I have been doing research on the McPhees for years. For the past ten years I have been going to Scotland for a month at a time to do research at various archives and libraries. I think a detailed study of the McPhees is long overdue and I would be interested in working with anyone interested. There is much more to the McPhees than just as tinkers. Perhaps I should have left my email address -- avocaqc@gmail.com -- since I don't know for sure if you have access to it through my previous message. I would love to hear from you. If any decendants of Ewan and Mary Mcphee see this, id love contact. I am a distant cousin in Australia. You will find me on Facebook.